This summer's extreme weather has put Danish trees on high alert. In the worst cases, the lack of water has caused many trees to die. While oaks have been most resilient, smaller trees and those rooted in the sandy soils of Western Denmark have struggled. We will only be able to fully gauge the toll of this year’s drought after half a year, at earliest, according to Senior Researcher Vivian Kvist Johannsen of the University of Copenhagen. Even trees suffer from drought. Birch, maple and other tree species around Danish cities are already assuming a browned tinge on their leaves due to their inability to access water. The lack of rain and high temperatures have catalyzed a defense mechanism that reduces photosynthesis and gradually shuts trees down, resulting in slowed growth. Trees planted roughly within the last year are very susceptible to dying in drought conditions because their root systems have not yet fully developed. Senior researcher Vivian Kvist Johannsen of the Department of Geosciences and Natural Resource Management at the University of Copenhagen compares this year's drought with previous dry summers, such as those of 1975-1976 and 1992, as well as 1994-1996, during which the ends of summers saw extensive damage to and the death of trees. "This year, trees are more vulnerable to injury or death than ever registered. But with regards to how hard the drought has hit, we will only be able to tell by autumn, at earliest, and perhaps not until years ahead if a streak of dry summers happens," she said. Unlike agricultural crops, trees respond more slowly to drought, and damage is reflected much later. This was seen with spruce trees that succumbed to drought in 1990-92, but had already displayed sensitivity after a lack of water during the hot summers of 1975 and 1976. Soil type plays a vital role when it comes to the survival of trees during dry spells. Trees rooted in sandy soils will have a harder time finding water than those in clay rich soil. The researcher predicts that trees in Western Denmark, where the soil is sandier, will be hardest hit. But there is also a difference in how hardy various trees are, as well as how they are affected by local hydrology. "Oak is the most resilient. It has very extensive root systems that can draw water from deep down," explains Vivian Kvist Johannsen. Trees live for a long time and have a number of defense mechanisms that are activated during periods of stress. The first is to keep leaf pores, or stomata, closed to conserve water. However, this limits CO2 uptake and as a result, photosynthesis is inhibited. Gradually, high temperatures and continued solar exposure creates a problem for leaves, which may then wilt. "Birch, maple and other trees are already showing their fall colors. 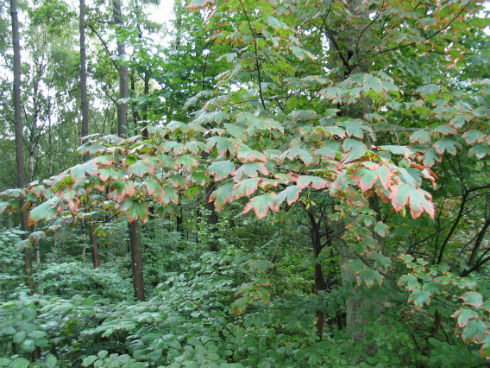 The brown edges on the leaves of many trees are in direct response to the drought. Should the drought continue, oaks may begin to shed their leaves and even entire branches. When trees begin to shed their leaves and twigs, the positive side-effect is that their need for water is reduced," explains the senior researcher. Trees in cities and along roadsides are also affected. Besides drought, winter road salt increases the salinity of the water around trees, making it difficult for them to absorb water. And, city asphalt and drainage ducts direct water away from tree roots or inadvertently inhibit root growth.